Short Review: Artechoke Media have mashed together DVDs, books and instructional websites to create a new way of learning. This innovative format features descriptive text, animated GIFs from multiple angles and embedded videos, appealing to multiple learning styles at once. Even if you're uncertain about moving away from orthodox instructionals, with more than three hours of video content, Mastering the Crucifix can satisfy a traditionally-minded audience as well. Guided by Matt 'Aesopian' Kirtley, Mastering the Crucifix breaks down the titular position into two main variants (kneeling and the traditional face-up positions), along with a range of entries, troubleshooting and Kirtley's trademark reverse omoplata. Some of those descriptions might benefit from a close-up on grip details and a slow-motion option, but those are minor quibbles. Either way, given the considerable quantity of content, this is good value for money at $39.95. Available to buy here from Artechoke Media. Full Review: Artechoke Media was founded by Marshal Carper, who already has experience in the instructional market after working with luminaries like Marcelo Garcia. For Artechoke's first major release, he's teamed up with the Godfather of BJJ Blogging, Matt 'Aesopian' Kirtley, a black belt under Eduardo de Lima who has been active posting great content on the internet for over a decade now. Aesopian.com has covered numerous techniques across that long period. The most notable is probably the reverse omoplata: Kirtley has gone on something of a crusade to prove that this is not the complex, advanced position that many (including me) feel it is and therefore dismiss out of hand. For this initial foray into commercial instructional products, Kirtley has decided to explore the reverse omoplata as part of a broader position, the crucifix. This too suffers from a perspective that it's a novelty move, though perhaps to a lesser degree than the reverse omoplata. I've only very recently incorporated it into my game, thanks to a Dave Jacobs seminar back in April. It's entirely changed my approach to the turtle, although I haven't yet had much of a chance to test it in class. I'm therefore planning to revisit this review when we do another month on the back position at my Bristol BJJ club, Artemis BJJ. The instructional market used to be focused on books, based around a sequence of illustrations with some descriptive text. That later progressed to photographs, adding motion with the arrival of videos. A couple of decades after VHS hit the scene, DVDs took over: that is still arguably the medium of choice today, though it is losing ground to a more recent innovation. In the last couple of years, there has been an explosion in instructional websites, originally starting with pioneers like Jean Jacques Machado and Jason Scully's Grappler's Guide, before hitting the mainstream with MGinAction and Gracie University. For their own instructionals, Artechoke Media have come up with something new, combining several of these formats into one. Having previously tested the format with an earlier free offering, Artechoke's Mastering the Crucifix isn't a book, a video or an online instructional site. It's all three at once. There is the descriptive text of a book, moving images like a DVD (not to mention an actual video at the bottom of most pages) and (to a degree) the functionality of an online instructional. 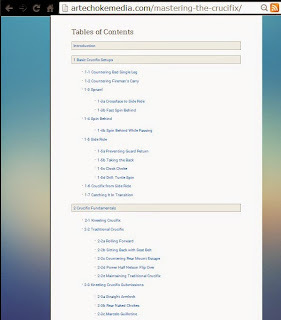 You can navigate through the book via the online contents page, hyperlinked to each section. There's also a drop down menu you can access in the top right when reading through the book. Clicking on a heading brings you to a selection of animated GIFs, accompanied by a normally concise segment of written explanation. The pictures begin animating automatically: on my not especially fast connection, there were no issues with that part of the book (it isn't quite a book, but I'll keep using that term for ease of reference). There is also a video at the bottom of most pages, giving you something akin to the DVD experience on top of everything else. Remember to turn off any flash blocking plug-ins you might have on your browser, or make an exception for the Artechoke Media page: otherwise those videos won't load. Another advantage of an online model is the potential for interactivity. Each page of the book has a comments section underneath, linked to Facebook. As this is still a new book, I can't see any comments so far, but if it takes off, an informed technical discussion could add considerable value to Mastering the Crucifix. Even an uninformed conversation may be beneficial, highlighting further common problems that a comment thread could go some way towards answering. It may never happen, but I'll be checking back in a few months to see if anything changes. Unlike many instructional websites, it is also possible to digest the material offline as well. There is the option to download a PDF version, where you can click on the pictures to load up embedded videos. If you right click, there are multiple options, such as floating video or full screen viewing. It could be further improved if there were some additional features, like slow motion, but it's a promising development. As with the online version, you can navigate via links on the contents page. The PDFs are large and split into sections: for example, the first of the four parts is thirty-three pages long, but all those embedded videos mean it is almost 500 megabytes of data. There is also the option of downloading the book as EPUB files, but those are larger still. I wasn't able to get either PDF or EPUB to function on my Galaxy Note, having tried several different EPUB and PDF apps, but your experience may vary. I was able to read the PDFs with no problem on my laptop. 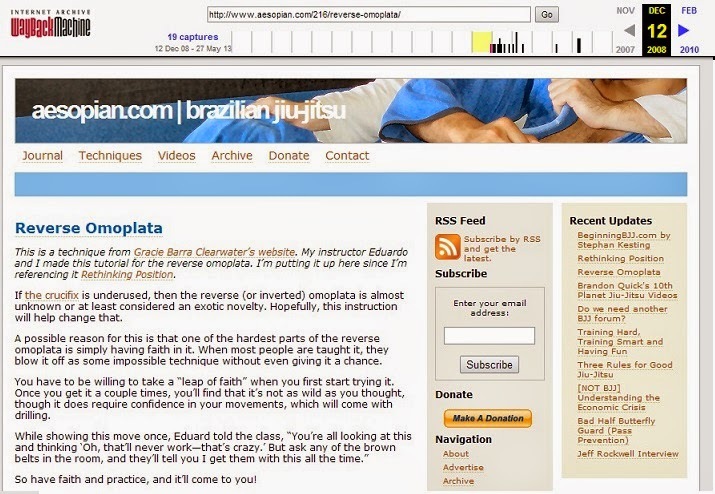 Many companies in BJJ have adopted clunky '90s squeeze page marketing, promising 'secrets' and 'but there's more! ', often touting artificial scarcity as motivation. In marked contrast, Artechoke have a much less obnoxious approach. They offer you a straightforward free preview of the book, providing access to all of Chapter 2. There's no catch, no attempt to sign you up to a mailing list and no endless sequence of cheesy testimonials. Mastering the Crucifix starts off with an introduction from Kirtley, reminiscent of the popular biographical segments in Victory Belt publications (before they moved their focus from martial arts to paleo diet books and the like). That connection with the author was often a Victory Belt highlight: sometimes, it became a significant proportion of the text, as when the publishers gave free rein to Eddie Bravo in Mastering the Rubber Guard. Kirtley's introduction to BJJ is one I can relate to, as a fellow geek. This isn't some world champion telling you how they trained really hard in some sweltering Rio academy, it's a Dungeons & Dragons enthusiast describing how they went from pen and paper to the distinctly physical world of grappling. The technical detail begins with basic crucifix set-ups, mainly entries. Sensibly enough, that starts with an introductory summary that has a quick GIF to represent each sub-section. The goal is to encourage readers to think of the crucifix as a potentially major part of their arsenal, rather than as something put beyond reach by complexity or a low percentage novelty move. Kirtley's first entry is a counter-attack to a takedown attempt, shown from three angles at a steady pace. Due to those GIFs, much less technical explanation is required in the text. That enables Kirtley to instead write more generally, with points like "The key is recognizing the opportunity and seizing it." In common with several other books, there is a 'what not to do' section, where the relevant GIF is outlined in red to indicate it's an error. 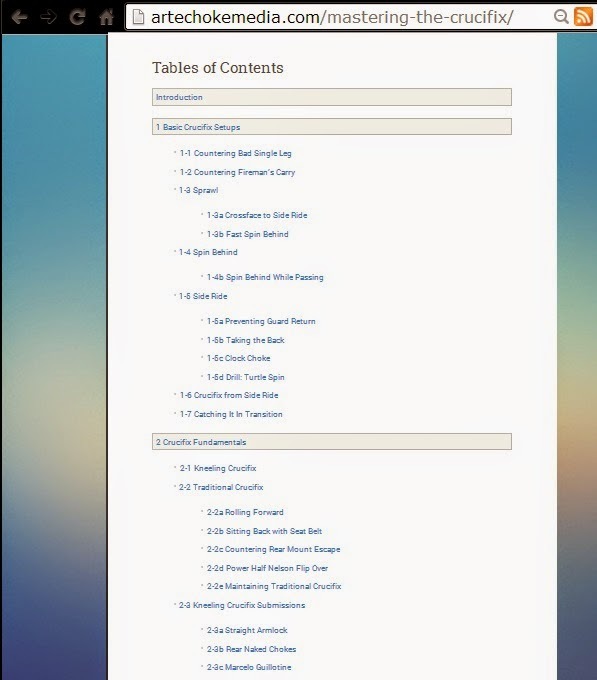 At the bottom of the page is the first of many videos (03:17 minutes), running through the details covered in the preceding text and animation. There are lots of sponsors that pop up at the start, to be expected from a project that relied heavily on crowdfunding to reach completion. Seeing all those sponsors every time you want to check the video is a little irritating, but that 10 seconds of advertising is much less annoying than the increased cost not having them there would presumably necessitate. That then progresses to countering a fireman's carry, entering the crucifix by trapping the arm and flipping over the top. Kirtley notes that this is risky and needs good timing: respect a skilful fireman's carry. Going for your own takedown is a better strategy. The video at the bottom (02:43 minutes) again summarises what happened before. I assume that the same footage was the source material for the GIFs, but I can't be totally certain of that. A third option to enter the crucifix off their takedown is sprawling. As Kirtley discusses, this is a fundamental skill to develop, especially if you are a regular competitor. Kirtley supplies a solid basic explanation, with details like whether or not to be up on your toes. The video is a little longer this time at 05:34 minutes, replete with the sense of humour readers of Aesopian.com and listeners to his podcast know well. Next up, how to move from that sprawl into the front headlock, establishing a 'side ride' position. Cross-face their turtle by reaching over their shoulder, past their neck and to their opposite armpit. Kirtley's video this time is 02:32 minutes long. The related spin behind follows, initially a fast version (03:24 video), then two more measured options (06:28 minute video). That's a bit like Roy Dean's backstep: Kirtley sees this technique as essential for smaller grapplers in particular, allowing you to maintain a dominant position against bigger opponents. In the course of demonstrating the spin right to the back, he notes how if they flatten out, you'll end up in side control instead. That's the more common application: this is how I would use the technique, because I'm happiest (at least at this stage in my BJJ) when I'm either in side control or mount. Getting to the back is positionally even better, so it's worth taking it that step further if possible. Passing can give you a chance for the spin behind too, as they turn and try for an underhook. Kirtley shows how this might work with the bullfighter, x-pass, knee cut (he calls this 'cross knee') and leg drag. The video at the end (03:51 minutes) combines all of those passes, broken up individually in the GIFs above. There is often quite a lot of talking with each video, something that makes sense given the reduction in descriptive text (generally speaking: some pages have a lot more text than others). However, if this was purely a DVD, you would probably expect those videos to be more concise. It does depend on preference: Saulo is a classic example of somebody who talks a great deal, which some people find enlightening, while others view it as an overlong pause before the technical meat. Section 1-5 moves on to some grips when you've got to the turtle 'side ride'. Harness/seat belt is the basic one, then gripping the wrist. If I was being picky, I would have liked another angle on the spiral ride, to get a clear picture of what the hand by the hip is doing. You've also got 06:46 minutes of video to help further cement your understanding. It's worth noting that there is the option to make the video full screen and pause it, both potentially mitigating a lack of close-up grip detail. Kirtley next adds a few pointers on preventing them recovering guard (04:52 video), then a back take: Kirtley notes that while the crucifix is great, don't pass up opportunities for more orthodox attacks if they present themselves (04:18 video). Unlike some of the other shorter closing videos that act mostly as a summary, there is quite a bit more detail here than in the text and animation. For example, the point on holding the back with a single hook and crossing your legs, accompanied by various other details on the application and set-up for the back take. Getting into 1-5c, the clock choke is not easy to see, given the nature of the submission. I would probably add in a grip detail here, clarifying what you're doing with the collars by the neck. Kirtley acknowledges in the 03:42 video that you aren't able to see what he's doing during that finish, so mimes the action before he enters into the technique. Still, I think this section would benefit from a shot of the finishing grip and action, perhaps photographed from underneath, or simply shown out of context with the person getting choked sat upright and in view of the camera. 1-5d includes a few drills for maintaining control against turtle. Interestingly, this page does not go with animated gifs for the mistakes, but a textual list. The 05:40 minute video again adds in several details not covered in the GIFs or text, such as covering the back of your head for safety if you're the one in turtle. Kirtley even has some coaching tips, such as instructing your students to imagine that their sternum is stabbing through the middle of their partner's back. He also notes how that will change as people become more comfortable with the drill, because you're not staying clamped to the middle of the back as you move around. Speaking as somebody who does teach, I'm looking forward to trying out these drills on my students. Getting into the crucifix proper, there are many different ways of isolating the arm and trapping it. These range from smoothly technical to the brute 'caveman' solution. As Kirtley puts it, "if it's stupid and works, it's not stupid." Crude pain compliance is in there too: that can work, though personally I try to stay away from anything that relies largely on pain rather than leverage, or where pain is an unavoidable consequence (perhaps a foolish concern on my part given I'm doing a combat sport, but meh, I don't like hurting people). That large amount of information is reflected in the longest video so far, as 07:40 minutes. 1-7 puts all the steps together, coalescing the build-up into a few examples of how the drills can combine into crucifix entries. There's a a 03:51 closing video to end this segment of the book. Chapter 2, 'Crucifix Fundamentals' is the free chapter, so be sure to check it out whether or not you were planning on buying the book. Kirtley splits the crucifix into a number of variants: the kneeling crucifix, traditional crucifix, submissions for each of those positions, then recountering escapes. 2-1 Kneeling Crucifix covers the one-on-one grip, a little reminiscent to the entry I learned from Jacobs, but using your second hand for base rather than grabbing both wrists. That's followed by some more details on keeping your balance and control in that position, both summarised and expanded in a 05:01 minute video. 2-2 Traditional Crucifix moves into the position most people have in mind for the crucifix, face up with their arms trapped. Logically, Kirtley moves from the kneeling crucifix into how to reach that face up position (02:32 minute video), using a rolling motion. He notes that you won't always have the momentum for this roll, so you can wait for them to give it to you. In my limited use of the crucifix until now, I've been using the approach Dave Jacobs taught in April, where you basically walk backwards and fall into the crucifix. Kirtley doesn't teach that specific option, but approaches it in 2-2b. The entry here is sitting back, without a walking motion: you simply yank them back with your seat belt. Within the 03:31 minute video, there is another entirely different entry to the crucifix, digging your knee under their arm when you're in a sort of reverse side control position, facing up. The next section is especially good, as like Kirtley writes, it connects to the "normal jiu jitsu game," showing an entry as a back escape counter. This is among the greatest benefits of working on the crucifix, as it enhances your approach to the back in general. Since attending that seminar, I've found myself doing something like this transition a couple of times when countering a back escape. Once again, there are several additional pointers in the 02:54 minute video. Like the clock choke, I would have liked a grip detail on the 'Power Half Nelson' from 2-2d. I had a little trouble seeing exactly how Kirtley was locking his hands from the GIFs. However, it is perfectly clear from the 03:09 minute video. Watching that, I can see it is coincidentally the same grip I saw somebody use yesterday at the open mat when holding back control. 2-2e is an especially important section, describing how to maintain the crucifix, reflected in the greater length of the 06:55 minute video. The GIFs are helpful, with some examples of how they can escape, but the video has much more information. An instructional that includes maintaining a position and troubleshooting potential counters is infinitely more valuable than the submission and sweep catalogues that have been a mainstay of the market up until more recently. Of course, once you can maintain, then it's possible to move into those submissions. 2-3 looks at attacks from the kneeling crucifix, beginning with a straight armlock in 2-3a (02:54 minute video), then three variations on the RNC (standard, palm-to-palm and one-handed) in 2-3b (05:54 minute video). The section finishes with a guillotine, where they switch to nogi: Kirtley finds he doesn't go for them much in the gi. This particular variation is from Marcelo Garcia and arguably finishes from guard, though Kirtley does start it from the crucifix (04:48 minute video). They are wearing similarly dark rashguards, making it harder to distinguish what is going where (not a major problem, as that's it for nogi in this instructional). Rear naked chokes are up next in 2-4b. Kirtley suggests using what he calls the 'pinkie-knuckle grip' as he feels that is tougher for them to break. It's visible in the GIFs of the choke, but the 04:47 minute video makes it clear, particularly if you're watching full screen. Straight armlocks produce a comparatively massive 07:55 minute video, emphasising the importance of combining attacks. I can't see myself using a neck crank, appearing in 2-4d, but that's personal preference (I'm wary of leg locks for the same reason, but I imagine I'd view them differently if I regularly used leg locks/neck cranks and had a greater understanding). Kirtley highlights the danger of cranks, an importance safety note, further investigated in a 05:14 minute video. 2-5 is all about recountering escapes, starting with the Marcelo Garcia seat-belt strategy. This was mentioned briefly in the section on maintaining the crucifix, getting a more in depth look here. It's a recovery to the standard back position, rather than the crucifix. To continue with the crucifix, there's also some discussion of getting that arm back if it slips free. The video at the end spans 05:24 minutes. There is a simple switch into side control if you lose the crucifix, with the option to go to a spinning armbar (02:46 minute video), until the chapter ends with a kimura off the same turn (03:10 minute video) and the kimura as a control to take the back (04:17 minute video). Chapter 3 is all about Kirtley's speciality, the reverse omoplata. He has been championing that technique on Aesopian.com for a long time now, with some notable success stories (like a guy who managed to learn the technique from Kirtley's site to the extent that he's even won MMA fights with it). I have a pathological aversion to anything seemingly flashy or complex and like I've mentioned already, I also shy away from anything that has (or seems to have) a high likelihood of causing serious injury. First, let’s de-stigmatize the name. Plenty of people have a hard enough time with normal omoplatas, and adding “reverse” to any technique usually doubles the perceived complexity. “Reverse omoplata” is a double offense. Maybe using the names “kimura with leg” or “rolling shoulder lock” is less intimidating. This technique has little to do with the regular omoplata, aside from both using the leg to crank the opponent’s arm and shoulder. Having heard that there was going to be a whole chapter on the reverse omoplata, I had initially been a little put off the book. While I want to work on the crucifix, I have little interest in the reverse omoplata, for the reasons Kirtley points out. As my frame of mind is one he explicitly sets out to change, this would be a good test of how persuasive he can be. The opening video is beefy at 07:31 minutes, breaking the technique down into five steps. Kirtley has gone for the option of showing it all at once before breaking it down. That has the advantage of providing context for the coming sections, a sensible structural format. You could perhaps argue that it does also further scare people off if they're already hostile to the technique, as showing it all at once emphasises the complexity to those who have pigeonholed it under "too advanced for me" before viewing. That's probably unavoidable though, given that there is rolling and lots of fiddling with legs and arms involved. Kirtley begins with a troubleshooting section. The initial part includes an armlock that looks a bit like the kneeling crucifix shoulder lock from the Jacobs seminar. However, this is very much on the arm rather than the shoulder and it's also fairly easy to escape (intentionally so, as that escape puts their arm in position for the reverse omoplata). It becomes clearer after you watch the 03:48 minute video. The next point is about staying committed to the rolling component (03:26 minute video), then conversely on preventing them rolling out (02:11 minute video). 3-2d appeals to me, as that discusses how to complete the reverse omoplata without rolling. taking them backwards or sideways instead (05:48 minute video). In 3-2e, I got confused by the description about running behind, but the 02:11 minute video cleared that up, as it demonstrated what he meant. In 3-2f, there is lots of rolling and spinning, where again the 03:20 minutes of video helps to clarify what is going on. The chapter finishes off with a drill for the reverse omoplata, but there is no video, just a GIF. Mastering the Crucifix ends with a fourth part discussing advanced crucifix set-ups. 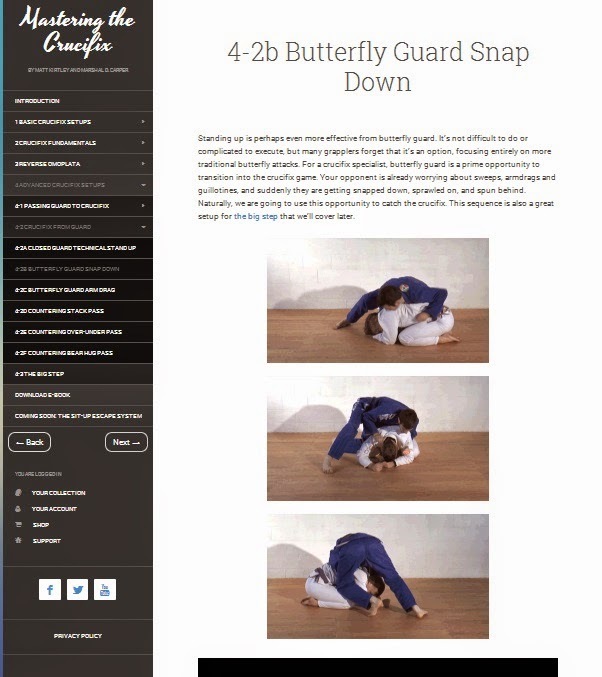 As with the reverse omoplata, Kirtley tries to mitigate the intimidating connotations of the term 'advanced': "The advanced aspect is that they may require you to know another technique to create a combination or may call for a heightened sense of timing, or expect you to be confident in your crucifix control." That's builds on the idea of 'basic' as meaning "does not require a pre-requisite", a useful definition. Pre-requisites are certainly required for the next section, as this chapter is all about countering and combining techniques. For the opening combination, it is assumed that you have a good handle on your stack pass, or this method of going into the crucifix right off the pass is not going to be of much use to you (04:57 minute video). That's followed by countering their pendulum sweep attempt (03:29 minute video), then dealing with the star sweep (from BJJ: Theory and Technique) by essentially dropping directly into the kneeling crucifix (03:11 minute video). The link between these sweeps is that they are already gripping your leg, making them vulnerable to the crucifix leg configuration. In 4-1d, the focus is on countering sitting guard (03:06 minute video), but it's applicable whenever they hug your leg from a guard position (Kirtley suggests you might have stood up in butterfly guard as well, or perhaps they're attacking from de la Riva guard). It's another technique that you could fit into a 'normal' BJJ game, especially if people at your academy play a lot of sitting guard or similar styles. 4-1e follows a comparable pattern, as again the situation is that they have wrapped a leg, this time from deep half. Although this is something Kirtley has been developing to deal with his instructor's penchant for deep half, it's cool how he carefully acknowledges his sources right at the top, then again in the 05:04 minute video. After all those counters, Kirtley demonstrates how the crucifix can be part of your offensive guard arsenal. Using the technical stand-up in 4-2a (03:28 minute video), you can snap them down and then enter into your crucifix: this could slot in with the cross-grip series I've been looking into recently. 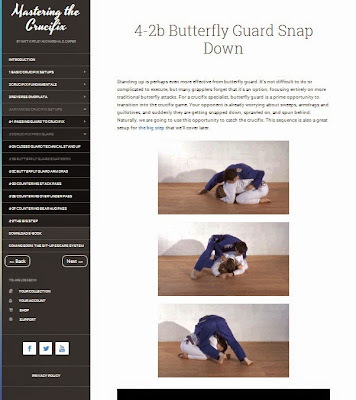 Kirtley suggests the technical stand-up can work even better from butterfly (02:57 minute video), or you can use an arm-drag (04:23 minute video). Next in his guard section, Kirtley gives you a insight into how the stiff-arm/sit-up escape system might look when it's covered in the next Artechoke Media release, showing how you can use that principle to counter a stack and enter your cruficix (04:34 minute video). He then covers a counter to the over-under pass, making it look very easy (04:31 minute video), before finishing with a crucifix entry against the 'bear hug' pass (03:00 minute video). The very last chunk of technical discussion is all about what Kirtley calls the 'Big Step' (05:40 minute video). It is a way of skipping a few stages en route to the crucifix, but requires the experience and sensitivity to maintain your balance in an awkward position. There are a number of applications, condensed into a single page. Unlike most of the other sections in Mastering the Crucifix, this doesn't split out any further. That puts you at the end of the book, leading to the 'download e-book' page, followed by a quick advert for Jeff Rockwell's upcoming sit up escape instructional. I am a big fan of BJJ companies that are willing to innovate, such as the use of hemp in the gi market. Artechoke Media are leading the way when it comes to innovation in the BJJ instructional sphere, but there is an inevitable question: does this improve upon the alternative? After reading through the book a couple of times and watching the videos, I think you could argue that readers would get just as much out of it if there was no book or GIFs and the videos had been released as a DVD instead. Only having access to the videos through the cloud is limiting, as it means you can't watch these away from a WiFi connection unless you've got an excellent data plan on your phone. Having said that, there are a number of advantages to the format Artechoke Media have chosen. The GIFs are especially helpful if you just want to quickly review a technique, rather than watching the entire video again. The manner in which they are available offline in PDFs/EPUBs is (as far as I'm aware) unique in BJJ and a considerable advantage, although it is a shame the PDF versions don't appear to function on mobile devices (though I'm purely basing that on my Galaxy Note). There is also scope for interactivity, if Artechoke Media and Kirtley are able to generate an ongoing discussion with readers. That is a big if: in my experience with instructionals so far that permit a level of interactivity, the only example that appears to be achieving a reasonable degree of interaction is the Grappler's Guide. Most of the other sites I've seen so far struggle to go beyond the occasional comment from readers saying "great video!" If Artechoke Media can build on their current Facebook functionality, the potential is huge. In terms of level, I would not recommend this to white belts (there are very few instructionals I would recommend to white belts: beginners tend to lack the frame of reference to get much out of supplemental material). Above that, this should be suitable for blue belts and up, as long as those blue belts have spent a lot of time attacking the turtle. You'll also need to have a good internet connection for the videos, though once you've watched them a few times, the embedded videos in the PDFs should provide a sufficient refresher. I had the occasional connection issue with the videos, but given that my internet package isn't very swish, I would assume that is a problem at my end rather than Artechoke Media's site. I'm looking forward to future Artechoke Media projects. Kirtley was a good choice to start things off, as he's a charismatic presenter able to use humour to keep the audience interested. He also has an excellent reputation among the internet-savvy segment of the BJJ population, a prime market for a product like this. Jeff Rockwell is a similarly well-regarded figure on the net and a very good teacher: I can vouch for that personally, having trained with him a couple of years ago. I'm also excited at the prospect of Val Worthington's book, mentioned in her recent interview. If you want to develop some more attacking options against the turtle, then Mastering the Crucifix will provide plenty of ammunition. I'll be stocking up my own limited arsenal during the next back month at Artemis BJJ, when I'll return to this review for an update. Update October 2014: I've now spent a month focusing on the turtle position at my school, especially the crucifix. Both in terms of teaching and training, Mastering the Crucifix has worked pretty well as a supplemental tool. I was already beginning to use the crucifix as a result of the Dave Jacobs seminar, but Aesopian's book has helped solidify it as an attacking position for me. His tips on the crucifix armbar were excellent, helping me both improve my own usage of the technique as well as teach it. Most impressive of all, I found I was able to teach a class on the reverse omoplata to complete beginners, without anybody struggling to complete the motion in sparring. Mastering the Crucifix is available to buy here from Artechoke Media for $39.95. Considering that you get a book, a heap of animated GIFs and over three hours of video, that's good value for money (by contrast with something like The Black Belt Blueprint, which would have been greatly improved and justified its price tag if it had adopted a format like Mastering the Crucifix).